The Gladiator Class Star Destroyer might as well be called "Demolisher", and frequently is, after the 10 point title granting it the ability to move and then shoot. 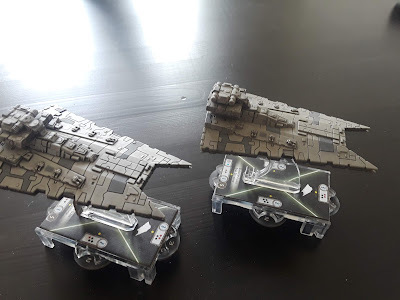 Since Wave 1 it has held a strong place in the Imperial pantheon of strong ships, an impressive feat for a ship that is only 56 points for it's base cost. It's been used by the US Champion in 2015 (GenCon Special), won the 2016 World Cup (Clonisher), and has been a feature in most Imperial lists ever since. 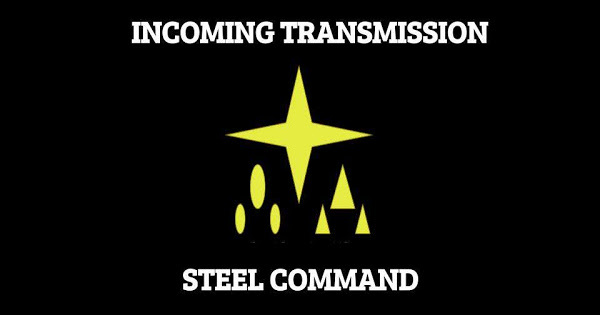 The title has since been nerfed with Errata limiting the post-move attack to just the first movement you make, meaning you can no longer combine it with Engine Techs to move Speed 4 and smash black dice into some unsuspecting fool who didn't (or couldn't) respect your threat range. Still, that makes the title merely "very good and nearly required to use the ship" and not "ungodly overpowered" and "automatic inclusion in any Imperial list". Both the Gladiator Class Star Destroyers (GSD for short) are competitive, but for very different reasons, and both require different builds to utilize properly. They both have the same upgrade suite - Officer, Weapon Team, Support Team, Ordnance. They both have 2 Command Value, 2 Squadron Value, and 3 Engineering Value, putting them a step up above the CR90s Hammerheads and Raiders of the world. Defensively, they sport a pretty good set of defense tokens - Brace, Redirect, and Evade - as well as 5 hull and 3 shields front / 2 side / 1 rear. They aren't invincible by any means, but they are a difficult prospect to ace down in a single attack, and often you will need to weather only one to deliver your payload. Speaking of payload, both ships are Black dice heavy, running 2 Red / 2 Black on their front arc, 1 Red / 1 Black on the rear, and 4 dice of some sort out the sides. Here is where the difference in the ship classes comes into play, with the I-Class having 4 Black out the sides, while the II-Class has 1 Red / 3 Black. For Flak, the I-Class has a single Blue die, while the II-Class has 2 Blue. Aside from cost, that is the only two differences between the GSD's two ship classes. For movement, the Demolisher GSD runs II / I,I / -,I,I giving it very predictable maneuverability at Speed 3, but great Speed 1 / Speed 2 maneuverability. Because of this, the ships practically comes with Engine Tech stapled to the Support Team slot, and you might as well set 6 maneuver dials for it at the start of the game (or figure out a way to bank it some nav tokens). Because of Engine Techs though it is amazingly maneuverable in a way that the MC30c (it's closest rebel counterpart) cannot quite match, able to either turn on a dime effective speed 2 (while staying speed 1) or covering effective Speed 4 (Speed 3 plus Engine Tech) to get into the best possible position for the next turn, with 5 different yaw clicks. All this for just 56 points for the I-Class and a significant jump of 62 points for the II-Class. For titles, Demolisher is the other card that might as well be stapled onto the ship. So, start figuring that 56 points for a GSD I-Class is actually 66 with the title, and 74 points after Engine Techs. Then start calculating other upgrades. 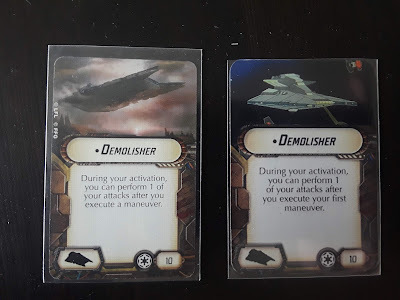 Demolisher pre-nerf and post-nerf (right). The only other title options for the Demolisher GSD are Insidious, which allows you to use black dice at medium range when attacking a ship from the rear hull zone for 3 points, or the Seventh Fleet Star Destroyer - as it is a Gladiator Class Star Destroyer - letting it act as a support ship for other Star Destroyers you might be bringing along. Neither one is as impressive compared to Demolisher for offensive power, and usually stay in your binder unless you're putting together some sort of gimmick list. For officers, the big ones to consider are Intel Officer, an old staple of ensuring maximum damage from the GSD would go onto the enemy ship by ensuring the 1 Brace a ship was likely to have would only be usable for 1 of the 3 attacks of a last/first Demolisher. Other options tend towards the defensive, with Minister Tua for a defensive retrofit, Admiral Monteferrat to make attacks on you obstructed (assuming you will spend a lot of your time at speed 3) or Captain Brunson (always a good choice for a defensive upgrade, regardless of the ship). Agent Kallus is a new inclusion on the GSD II-Class, which we will discuss more in a bit. The Weapon Teams is almost 100% of the time going to be Ordnance Experts. There's literally no reason to take anything else. "But what about...?" No. Ordnance Experts works better. "But what if I...?" No. Ordnance Experts works better. "What if I brought Darth Vader as my commander?" Good, now Ordnance Experts will work EVEN BETTER. Fish for crits on every dice. Unless you want to save points by just not bringing any Weapon Team. Your Support Team is going to be Engine Techs, with a rare gimmick of running Projection Exports in a supporting role. Ordnance is where things get interesting, and really define what kind of Demolisher GSD you're bringing. You're "bread and butter" ordnance these days are Assault Proton Torpedoes. At 5 points they add an extra damage in the shape of a face-up damage card dealt before any other damage resolves, which is pretty darn good, especially if the rest of your list is equipped with XI-7s or other "drill" options for getting at that enemy hull, and you've got over an 80% chance of rolling one out the side arc with Ordnance Experts if you reroll anything that isn't a hit/crit. That's about as close to a sure thing as you're going to get with rolling dice. Option #2 is Assault Concussion Missiles. For 7 points it's a bit more expensive, but better if you're just trying to put PURE DAMAGE onto something. Instead of a critical damage card, you splash 1 damage onto both the adjacent hull zones of the one you're attacking. Good if your list is more about overwhelming the target with pure damage potential instead of drilling. Heavy Ion Emplacements on other ships, for example. Option #3 is External Racks. Sometimes you just want to go "cheap" and being able to blow an extra 2 rerollable Black dice at 1.25 damage per with your Ordnance Expert Reroll is the best call, and it's the cheapest at 3 points. But why go cheap when you can build a Clonisher? Option #4 is rarely seen these days but takes Expanded Launchers, giving the front arc those 2 extra Black dice at 1.25 damage per with Rerolls every single time they attack, and of all the black dice ships the GSD is the one most likely to get more than 1 attack in. But we've only been talking about the I-Class here, because there's no good reason to put one of these on the II-Class chassis. After all, the I-Class has more Black dice, and is cheaper to boot. Why would you want a single Red out the sides? You don't, that's the answer. Those dice are actually a strike two against the II-Class, with strike 1 being the 8 points of increased cost. Engine Techs are only a little optional here, but you could leave them out for an extra 8 points. The idea behind this is just what we talked about above, it can race into medium range of an enemy squadron blob and flak away. With 2 Blues, it doesn't matter if the enemy squadrons are obstructed or not, you're rerolling Blacks fishing for the hit/crit, and probably taking Screed to guarantee a lockout on a specific enemy squadron, so remember to shoot the most important ones first. The GSD here can still contribute to anti-ship combat if the enemy didn't bring squadrons. The baseline GSD these days, nothing too fancy. Just a bonus critical effect on the Black dice, Ordnance Experts, the Title, and Engine Techs to get you there. Good for killing ships, and not much else. 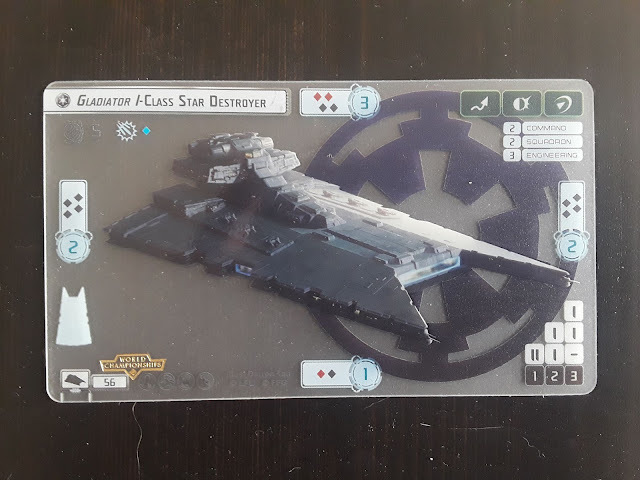 Not quite the "classic Clonisher" which tops out at an impressive 98 points, but this is probably the most expensive ship you'll be seeing these days. Hits like a freight train, loves to get the last / first 3 attacks. A gimmick, but about the best one you're going to reasonably get that does the job. This build can use projector experts to spread damage to the other Star Destroyers it is accompanying, help mitigate damage with the Seventh Fleet title, and still mix it up if an enemy gets too close. It doesn't do any of these things well, but is a jack-of-all-trades sort of build. Think long and hard before you commit to something like this. That's it for this Commander's Guide. Clearly I need to do some more. I'll try to stay on top of it. Thanks for the article update!